(1) Reprinted with the kind permission of Mr. Richard O. Dodds. (ED). Mission #1. Ship #6. 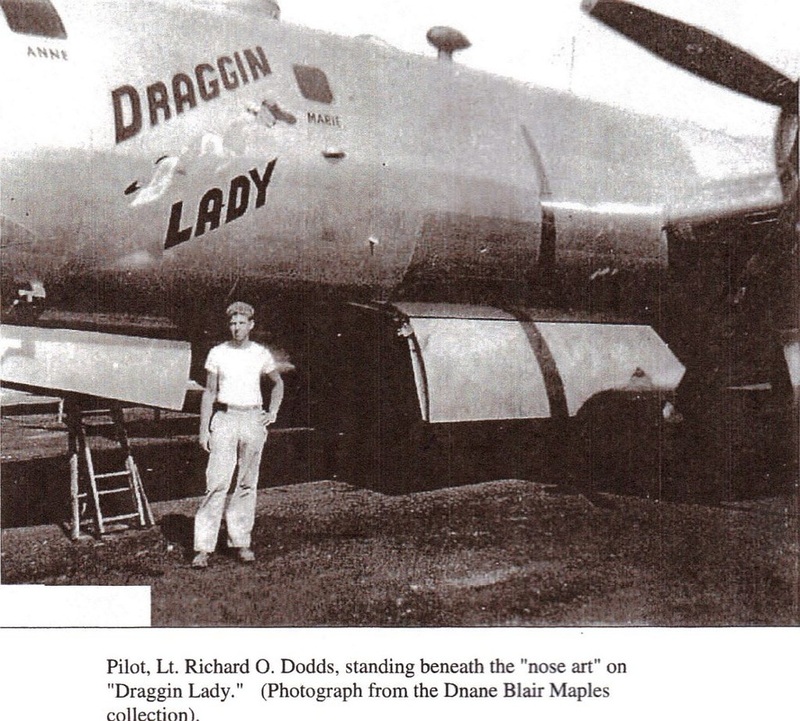 ("Draggin Lady"). Date: November 24, 1944. Target: Nakajima Aircraft Plant (Tokyo). Total Flight Time: 13 hours, 30 minutes. Fighters: Fifteen attacks, thirty were seen. Bomb Load: 8 -500 Ib. Demolition. Altitude: 29, 500 feet Results: Unobserved, 8/10 cloud cover. Remarks: We bombed the secondary target, which were the dock areas of Tokyo. One fighter closed to within seventy five yards of our element. Mission #2. Ship #6 ("Draggin Lady"). Date: November 27,1944. Target: Nakajima Aircraft Plant (Tokyo). Total Flight Time: 13 hours, 50 minutes. Results: Unobserved, 10/10 cloud cover. Remarks: We had to abort the mission after landfall because of turbo surge in one of our engines. The squadron had a rough mission. We received credit for the mission! Mission # -. Ship #6 ("Draggin Lady"). Date: December 3,1944. Target: Nakajima Aircraft Plant (Tokyo). Total Flight Time: 12 hours, 20 minutes. Bomb Load: 10 - 500 Ib. Demolition. Altitude: 29,000 feet. Results: Unobserved, 9/10 cloud cover. Remarks: We had to abort the mission because of a blown stack on our number one engine. We did not receive credit for this mission. Mission # -. Search Mission. Ship #4 ("Black Magic"). Date: December 5,1944. Total Flight Time: 9 hours, 0 minutes. Remarks: This was a search mission for a crew that had ditched on December 3,1944. We searched all of the islands between Saipan and Iwo, except Pagan, which was Japanese held and fortified. We made a square search in the assigned area. Our search was unsuccessful. Major Luman went with us. Mission # -. Ship #6 ("Draggin Lady"). Date: December 8,1944. Target: Iwo Jima. Total Flight Time: 7 hours, 55 minutes. Remarks: We participated in a coordinated attack with our fighters and the Navy. We did not receive credit for this mission. This was our first practice mission with Lt Calhoun, our new Pilot Col. Reeve... [nothing follows]. (ED). Mission #3. Ship #9 ("Nina Ross"). Date: December 25,1944. Target: Nagoya. Total Flight Time: 13 hours, 00 minutes. Bomb Load: 12 -425 Ib. Incendiaries. Altitude: 20, 000 feet. Results: Good, 2/10 cloud cover. We bombed Chichi Jima by radar and received credit for the mission. Mission #4. Ship #6 ("Draggin Lady"). Date: January 19,1945. Target: Akashi. Total Flight Time: 15 hours, 00 minutes. Bomb Load: 10 - 500 Ib. Demolition. Results: Excellent, 1/10 cloud cover. Remarks: We made a visual run on the target We received three flak hits in old six. I flew the bomb run! Mission #5. (2) Ship #? Date: January 28,1945. Target: Weather Strike Mission. Total Flight Time: 14 hours, 15 minutes. flight log. I have inserted it here because credit was given to the crew for this mission. See Appendix C for a copy of Mr. Maples' flight log. (ED). Mission #6. Ship #7 ("Hell's Belle"). Date: February 10,1945. Target: Ota. Total Flight Time: 15 hours, 20 minutes. Bomb Load: 13 - 500 Ib. Demolition. Altitude: 28, 000 feet. Remarks: McGuire, flying the lead ship of our element, was hit by flak and turned back half way down the bomb run. He was never seen or heard from after that The up-wind bomb run took forty five minutes! Our ground speed was [only] one'hundred and seventeen miles per hour! Mission #7. Ship #10. (Name of aircraft not known). Date: February 19, 1945. Target: Nakajima Aircraft Plant (Tokyo). Total Flight Time: 15 hours, 20 minutes. Remarks: We made a radar run on the dock areas. Two ships of our element were lost. Samuelson was rammed; six parachutes were seen, one on fire. Rouse went down in a spiral. 3 Mr. Dodds and his entire crew won the Distinguished Flying Cross for preventing the Japanese fighters from shooting Pearson's aircraft down over the target (ED). Mission #8. Ship #11. (Name of aircraft not known). Date: March 4,1945. Target: Nakajima Aircraft Plant (Tokyo). Remarks: We bombed Tokyo by radar. I flew the bomb run. We received some minor flak damage. Mission #9. Ship #11. (Name of aircraft not known). Date: March 10,1945. Target: Tokyo. Total Flight Tune: 14 hours, 8 minutes. Remarks: This was the first burn job on Tokyo. We saw about one hundred and fifty search lights but did not get caught in any. Mission #10. Ship #11. (Name of aircraft not known). Date: March 14,1945. Target: Osaka. Total Flight Time: 14 hours, 39 minutes. Flak: None. Bomb Load: 36 - 465 Ib. Incendiaries. Altitude: 6, 800 feet. Results: Unobserved, 5/10 cloud cover. Remarks: Our radar was bad and we were unable to locate ourselves until it was too late to go on to the target We bombed a Naval station on the coast as a target of opportunity. Mission #11. Ship #6 (New! ... "Booze Hound"). Date: March 18, 1945. Target: Nagoya. Total Flight Time: 15 hours. Mission #12. Ship #6 ("Booze Hound"). Date: March 27,1945. Target: Oita Field, on the Island of Kyushu. Total Flight Time: 15 hours, 25 minutes. Results: Good, 1/10 cloud cover. Remarks: This was our first mission to Kyushu. The missions are beginning to look like milk runs! Mission #13. Ship #6 ("Booze Hound"). Date: March 31,1945. Target: Tachikawa Aircraft Company on the Island of Kyushu. Flak: Meager and accurate. Bomb Load: 17 - 500 Ib. Demolition. Altitude: 15, 000 feet. Remarks: The enemy fighters did not seem to be very eager. They did not press most of their attacks. Mission #14. Ship #9 ("Nina Ross"). Date: April 2, 1945. Target: Tokyo. Total Flight Time: 14 hours, 30 minutes. Remarks: This was a night mission. We were caught in search lights for three to four minutes. We carried flares to h'ght up the target, but we were not very successful in doing so. Our gross weight at take off was one hundred and forty one thousand pounds. We received two flak holes in the ship. One ship was shot down over the target, and three blew up in route. Mission #15. Ship #5 (There'll Always Be A Christmas"). Date: April 8, 1945. Target: Kanoya Field on the Island of Kyushu. Total Flight Time: 14 hours, 37 minutes. Flak: None. Bomb Load: 17 - 500 Ib. Demolition. Altitude: 20,000 feet. Remarks: We hit the secondary radar target, which was the city of Kagoshima, on the Island of Kyushu. The weather was very bad. Mission #16. Ship #6 ("Booze Hound"). Date: April 14,1945. Target: Tokyo. Total Flight Time: 13 hours, 40 minutes. Results: Excellent, 3/10 cloud cover. period of time. Radar rope dropped from our B-29s seemed to confuse the search lights. Mission #17. Ship #6 ("Booze Hound"). Date: May 10,1945. Target: Tokuyama (Oil storage facilities). Total Flight Time: 15 hours, 11 minutes. Remarks: I flew the bomb run. This was our first mission after our rest leave to Hawaii. Mission #18. Ship #6 ("Booze Hound"). Date: May 14,1945. Target: Nagoya. Remarks: We were hit about eight times by fighters and flak. I hope we never see flak that close again. hit by shells from a Japanese fighter. 4 Mr. Maples* flight log indicates that the flight time for this mission was 16 hours, five minutes. See Appendix C. (ED). Mission #19. Ship #6 ("Booze Hound"). Date: May 17,1945. Target: Nagoya. Total Flight time: 14 hours, 4 minutes. Results: Good, 9/10 cloud cover. Remarks: This was a night mission. We saw very few search lights through the clouds. The fires on the ground were very bright as seen through the clouds. We were in and out of clouds most of the... [nothing follows] (ED). Mission #20. Ship #6 ("Booze Hound"). Date: May 19,1945. Target: Tachikawa. Total Flight Time: 13 hours, 15 minutes. Remarks: We bombed the secondary target of Hamamatsu by radar. The weather was very bad. We had to assemble the formation twice. I flew the bomb run. Mission #21. Ship #6 ("Booze Hound"). Date: May 23,1945. Target: Tokyo. Total Flight Time: 13 hours, 55 minutes. Results: Excellent, 2/10 cloud cover. Remarks: This was a night mission. The search lights on the ground were inaccurate. We saw two B-29s go down over the target We came very close to being rammed by other B-29's several times. Mission #22. Ship #6 ("Booze Hound"). Date: May 25,1945. Target: Tokyo. Total Flight Time: 14 hours, 35 minutes. Remarks: Several "Bakas" 5 and balls of fire were reported as having been seen by our guys. We were caught in the search lights three or four times. We went through the top of some smoke columns which made for some rough flying. Major Luman and his crew have been reported as Missing In Action. The Japanese fighters followed our B-29s out to sea. The missions are becoming dangerously monotonous. 5 A Kamikaze weapon flown by one pilot, the Baka or "Fool" flying bomb, was only produced in small numbers and did not see action until March 21,1945. See the US Strategic Bombing Survey; Strategic Bombing in 1945. (ED). Mission #23. Ship #6 ("Booze Hound"). Date: May 29,1945. Target: Yokohama. Total Flight Time: 14 hours, 45 minutes. Flak: Intense and accurate. Bomb Load: 176 - 70 Ib. Incendiaries. Altitude: 19,000 feet. Remarks: We had fighter cover over the target We escorted six P-51s back to Iwo Jima. We saw one P-51 pilot bail out of his aircraft thirty miles North of Kito Iwo. We received some flak damage. Mission #24. Ship #6 ("Booze Hound"). Date: June 1,1945 Target: Osaka. Flak: Intense and accurate. Bomb Load: 31 - 425 Ib. Incendiaries. Altitude: 18, 000 feet. Mission #25. Ship #6 ("Booze Hound"). Date: June 5,1945. Target: Kobe. Total Flight Time: 14 hours, 50 minutes. Fighters: Fifteen were seen, and there were three attacks. Remarks: One B-29 on fire blew up five miles from the coast. Ten parachutes were seen. The Japanese fighter attacking the burning B-29 was shot down by its gunners, and the enemy pilot bailed out. Mission #26. Ship #6 ("Booze Hound"). Date: June 7,1945. Target: Osaka. Remarks: I flew the bomb run. Nothing exciting for a change. Mission #27. Ship #6 ("Booze Hound"). Date: June 15,1945. Target: Osaka. S out of formation after bombs away. Mission #-. Ship #6 ("Booze Hound"). Date: June 17,1945. Target: Le-Shima. Total Flight Time: 14 hours, 10 minutes. Remarks: We escorted thirty three P-47s to Le-Shima. They were undergoing a change of station. We did not receive credit for a mission. We are a bunch of very disgruntled characters. Mission #28. Ship #16 (aircraft name not known). Date: June 20, 1945. Target: Fukuoka, on the Island of Kyushu. Total Flight Time: 14 hours, 51 minutes. Remarks: We hit smoke over the target, encountering terrific turbulence. We were caught in four to six search lights after bombs away. The right side of the rear bomb bay would not close as a result of being hit by one of our dropping bombs. 6 We decided we wouldn't go through any more smoke. 6 Actually, a bomb had jammed in its rack on the rear rack on the Aircraft Commander's side of the aircraft Radio Operator, Charles R. Maples, went out into the open bomb bay and kicked the bomb free of the aircraft (ED). Mission #29. Ship #6 ("Booze Hound"). Date: June 22, 1945. Target: Kure (Arsenal). Mission #30. Ship #6 ("Booze Hound"). Date: June 26, 1945. Target: Osaka (Arsenal). Remarks: We were unable to assemble our formation because of the heavy clouds. Each aircraft bombed individually. We were in clouds most of the time. The bomb run was done by radar. Mission #31. Ship #6 ("Booze Hound"). Date: June 29,1945. Target: Sasebo, on the Island of Kyushu. Total Flight Tune: 14 hours, 34 minutes. after bombs were away. The flak was all 40 mm. This was a night mission. Mission #32. Ship #6 ("Booze Hound"). Date: July 2,1945. Target: Kumamoto, on the Island of Kyushu. Total Flight Tune: 14 hours, 13 minutes. Remarks: This was a very easy mission. The hardest thing was trying to stay awake. Mission #33. Date: July 4, 1945. Target: Kochi, on the Island of Shikoku. Remarks: We had a down-wind take off! This was a night mission. The smoke over the target extended up to fifteen thousand feet! We did not fly through the smoke this time! Mission #34. Ship #6 ("Booze Hound"). Date: July 7,1945. Target: Akashi. 7 Lt Francis F. Merrick, Navigator. (ED). Mission #35. Ship #6 ("Booze Hound"). Date: July 10,1945. Target: Sakai. S/Sgt Alexander Wortovitch-Tail Gunner. (ED). Mission #36. Ship #6 ("Booze Hound"). Date: July 17,1945. Target: Oita, on the Island of Kyushu. Total Flight Time: 14 hours. Remarks: This was a night mission. Our radar was out, so we made a D.R. (9) approach to the target and bombed visually. All of our original crew have finished flying then- required number of missions. No more worries for awhile.